If you haven’t taken the initiative to recycle – today’s the day to start with Nov. 15 being America Recycles Day (ARD) and all. Since 1997, Keep America Beautiful has been bringing communities together year after year on Nov. 15 to celebrate ARD by raising public awareness about the importance of recycling. The 14th annual ARD celebration is a nationally recognized program dedicated to encourage recycling in the United States. On this one day,Keep America Beautiful asks everyone to take the pledge to reduce personal waste by recycling, and commit to recycling one new type of material within the next month. “I Recycle” is the 2011 theme of the America Recycles Day celebration.Keep America Beautiful partners with the National Recycling Coalition, Inc., the U.S. Environmental Protection Agency (EPA) and Earth Day Network 2012 to encourage community recycling programs and educational awareness. In addition to ARD partners, the nation’s top environmentally conscious corporations sponsor the annual event and include Earth911.com, GLAD, LG Electronics, Johnson & Johnson, American Chemistry Council, Anheuser-Busch, Waste Management, PepsiCo, O-I, Nestle Waters, Disney’s Friends for Change and Alcoa. PepsiCo is using the day to highlight its Dream Machine recycling initiative, with a team of recycling spotters ready and waiting to reward individuals for recycling in Dream Machine bins in downtown Washington, D.C. The Dream Machine program aims to help increase the U.S. beverage container recycling rate and, for all the bottles and cans collected through the Dream Machine program, PepsiCo will provide support to the Entrepreneurship Bootcamp for Veterans with Disabilities (EBV). “On America Recycles Day, we hope that more Americans will commit to recycling every day of the year,” said Jeremy Cage, senior vice president and head of the Dream Machine Recycling Initiative, PepsiCo. Waste Management (WM) aims to solve the nation’s garbage issue by investing in the most innovative technologies and finding ways to reuse the recyclable resources most residents and businesses normally toss into a trash bin. With 10 million tons of materials currently managed for recycling, Waste Management is now more than halfway to its goal of managing more than 20 million tons each year. In 2010 alone, WM processed enough material to fill a football field 2.11 miles high. To encourage more plastics recycling on the go, the American Chemistry Council’s Plastics Make it Possible initiative launched Bin It! – a new app that challenges people to recycle in an interactive game; available through iTunes. “While the Bin It! player aims to toss plastic bottles into recycling bins, our aim is to get everybody hooked on plastics recycling,” said Steve Russell, vice president, Plastics Division of the American Chemistry Council. The American Chemistry Council claims that 94 percent of Americans have access to a plastics recycling program. The organization’s hope is that the app will encourage users to “bin it” outside of the interactive space; giving rise to plastics recycling nationwide with more than 12,000 U.S. grocery and retail chains offering accessible plastics recycling bins. Alcoa and the Alcoa Foundation are also providing resources for individuals to recycle via mobile technology with its Alluminate iPhone app that allows users to set recycling goals and track progress in dollars earned. According to the Aluminum Association, Americans earn nearly $1 billion a year from recycling aluminum cans, yet nearly another $1 billion worth of aluminum cans are still tossed into landfills – one of Alcoa’s strategies is to encourage citizens to recycle based on revenue generated and potential job creation. Don’t know how to get involved on America Recycles Day (ARD) – here are some simple ways you can learn about recycling benefits and ways to actively participate in the recycle movement. Take the America Recycles Day pledge on the ARD website. By taking the pledge, you are making the commitment to recycle one new material within the next month and following months. You can also access the ARD toolkit, which includes a variety of resources about recycling education and ARD. If you’ve never recycled anything – first, find out what can be recycled by visiting the Environmental Protection Agency website. The EPA lists a myriad of items that can be recycled. Once you know what can be reused, the next step is to find recycling stations for that particular item. Get youth involved! America Recycles Day wants to encourage younger generations to care for the environment; visit the ARD website for a handout to teach youngsters about the value and benefits of recycling. 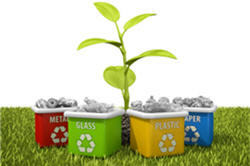 Gravitate toward recycled content products. Purchasing items made with recycled materials is a key part of "closing the recycling loop." Most stores carry recycled-content products; look for items with high post-consumer content. “Post-consumer” refers to material used by the consumer for its original purpose and then recycled and made into new products. RecycleSpot.org suggests for companies to hold a “Clean Your Files Day” (CYFD) to get in the recycling groove. Holding CYFD events are great ways for public and private entities to properly recycle office waste and raise recycling awareness among employees. CYFD events can focus on recycling paper and other office supplies and reusing or recycling certain types of equipment; also feature interdepartmental competitions and other fun, creative ways to involve staff. Just because you’re in the office doesn’t mean you can’t take part in America Recycles Day. Host a special collection event and provide direct recycling, waste reduction or waste diversion services to staff and/or the public. Special collections can include electronics collections, paper shredding, community event recycling, and targeted drives such as glass, clothing, household goods, etc. Stay up-to-date with recycle news by following America Recycles Day (ARD) on Facebook for new ideas on ways to stay involved.